Chris Vitek, President, Enterprise Telemetry, Inc. The savings related to the implementation of WebRTC in large healthcare operations can be measured in lives saved, and can exceed hundreds of millions of dollars. But first, I’d like to provide an overview of the technology and how it got to this point. If you know what WebRTC is, then go ahead and skip down to the use-cases. WebRTC supports browser-to-browser communications of real-time text, data, audio and video communications without the need to download an app. When Google and Mozilla deliver their implementations early next year it will triple the number of audio communications end-points in the known universe. These communications do not require local or long-distance telephone carrier services or connections. The “buy the device and pay to use it” business-model is under attack and enterprises are the key beneficiaries. Today, American enterprises spend $500B/year on telecom. Within five years this number will be less than $100B/year. For most of the last eight years, Global IP Solutions (GIPS) wrote object-code for the likes of Nortel (Avaya), Webex (Cisco), Yahoo and IBM to support their PC-based telephony applications. Last year, Google purchased GIPS. Earlier this year, Google open-sourced the licensing of this object-code and sponsored standards efforts with the IETF and W3C to embed this code in their Chrome browser. By the way, this is only possible with the implementation of HTML5 due to its enhanced ability to call local functions and data. Google is the browser of choice for more than half of all browser users. Mozilla and Opera Mobile have joined the product development and standards effort. Microsoft is participating in the standards efforts, but has reservations about the video implementation. However, all agree the text, file sharing and audio standards are solid. Opera mobile’s implementation is generally available now. Chrome and Firefox are expected early next year. So is this a big deal for healthcare communications? Well, Avaya, Cisco, Interactive Intelligence, Shoretel, Genesys, Mitel and Siemens are spending money to research and develop WebRTC interfaces. The last two have working implementations that should be generally available soon. And these companies represent 95 percent of the enterprise market, so it is a big deal. Clinicians can click-to-text or click-to-call from patient specific directories (drop-down box) embedded in the health information Web interfaces for each patient without the need to download an app. These communications will be supported by browser interfaces on their smartphone, tablet or PC. The directories are systematically gleaned from the clinical information system (CIS) or manually posted to the Web server. In addition to institutional contacts the contact information for the patient’s family members, outside therapists, clergy, etc…are all candidates for these directories. Optionally, for collaborative purposes, any user can push browser-based data to the called party so that both parties have immediate access to the same information. Patients can click-to-text or click-to-call from patient specific directories (drop-down box) embedded in the patient’s Web portal without the need for the patient to download an app. Patients can use their Web browser on their smartphone, tablet or PC instead of a room phones when they are receiving in-patient care or from home when being cared for on an out-patient basis. See the above paragraph for more information about the patient specific directories. In-home care patients will score their pain level or progress level through the patient Web portal. They can do this without the need to download an app to their smartphone, tablet or PC. If the patient scores their pain as 1-3, then the event will be stored on the Web server and pushed to the CIS. If the patient scores their pain at 4-5, then a call or text can be initiated with an administrator. If the patient scores their pain 6-7, then a call or text can be initiated to a nurse, if the pain is scored 8-10, then a text or call is initiated to the doctor. Additionally, if the patient does not score their pain or progress on schedule, then the Web server can automatically initiate a call between the patient and a clinician. Patients can click-to-text or click-to-call administrators to set, modify or get information about appointments from their patient Web portal without the need to download an app to their browser equipped smartphone, tablet or PC. These communications would be initiated from a patient specific directly (drop-down box) embedded in the patient portal browser interface. see above for more information about the patient specific directories. Patient’s family members in waiting rooms or outside the healthcare facility can click-to-text or click-to-call to initiate communications with administrators or clinicians regarding patient status (surgery, ER, etc…). These communications are supported by their Web browser on their smartphone, tablet or PC without the need to download an app. Initiation of communications would be accomplished with the use of patient specific directories. See the above paragraph for more information about the patient specific directories. Additionally, clinicians or administrators would be audibly or visually alerted to the fact that the caller is a family member and not the patient. Patients can click-to-text or click-to-call administrators to discuss invoices and bills from their patient Web portal without the need to download an app to their Web browser equipped smartphone, tablet or PC. 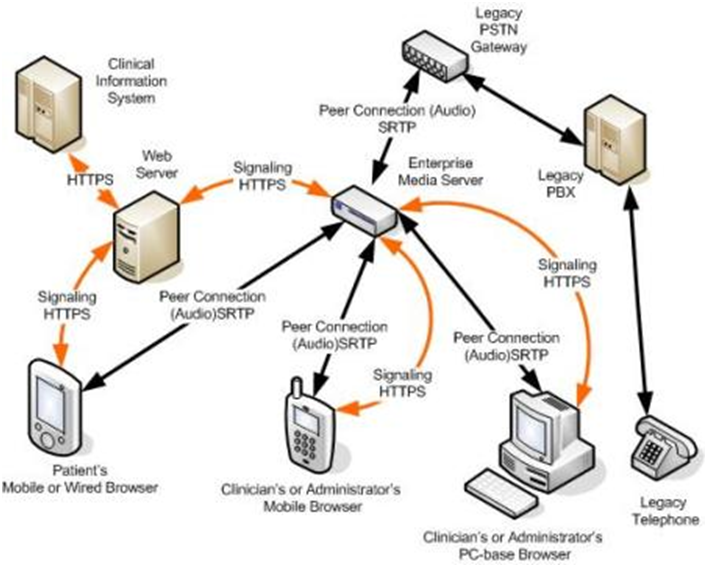 These communications would be initiated from a patient specific directly (drop-down box) embedded in the patient Web portal browser interface. Alternatively, clickable buttons can be provisioned on viewable images of invoices or bills that can be accessed through the patient’s Web portal. In these cases the communications would be directed to the specific department or person that can answer the patient’s questions. Test results can be pushed to the patient Web portal in real time. This can be in the form of a document or a text or both. These Web interfaces will also provide the patient with access to the patient specific directory discussed above. Further, patients will be able to use this directory to immediately connect with a clinician to discuss the results. Discharge notification can be distributed in real-time to all of the healthcare providers that are listed in the patient specific directory. These communications will be supported by Web browser interfaces on their smartphone, tablet or PC without the need to download an app. These communications could also include notification to the house-keeping staff. Legacy and WebRTC communications infrastructures can be integrated so that the legacy systems can be scaled-down slowly as they become less relevant. Clinically-based desk or wall phones become irrelevant or obsolete. Most healthcare professional already carry a smartphone and most have tablets and PCs. They simply log-onto their device’s Web browser and they are connected to the enterprise telephone switch. This gives them the ability to make or receive text or audio communications as long as the browser is open. The elimination of desk and wall phones in many large healthcare facilities offers financial savings in the $4M to $20M range. Further, the reduction in maintenance cost to support legacy telephones would be in the $1M to $4M range. Local and long distance telephone network charges for large healthcare facilities would become less relevant or obsolete. WebRTC communications are completely based on Internet Protocol. In large healthcare facilities the financial savings would be in the $2M to $30M per year range. Patient phones become obsolete. Patients can use their own smartphone, tablet or PC to communicate with the healthcare enterprise. They simply log-onto the patient Web portal and are able to make or receive calls. This works the same on-site or off-site. In large healthcare facilities this would eliminate the cost of the patient telephones as well as the cost of one or more telecom administrators assigned to support patient telephones. These savings would be in the $100K to $300K per year range. Clinical communications would be transformed from a fixed point-to-point architecture to an integrated, multi-device, mobile architecture. This architecture would be available inside and outside of the traditional healthcare facility or campus. This would reduce the need for voice messaging and e-mail messaging since employees will be more accessible. This infrastructure facilitates greater exchange of information and supports faster decisions that are more accurate. Clinical decision-making becomes more rapid. Traditional enterprise telecommunications systems are based on non-mobile devices. The market has responded to this flaw with several manufacturers of specialized wireless communications devices. WebRTC subscribes to both models (wired and wireless) to support rapid communications both on-site and off-site on the same interface. This advantage will support faster decision making and more rapid implementation of these decisions. More rapid communications related to in-patient discharge orders would result in a reducing patient stays by 3 to 6 hours and create opportunity for higher utilization of rooms and beds. The ability to create ad-hoc collaboration sessions without the need for downloading specialized software or apps will change the way that healthcare is delivered. Specifically, this will make information-rich, collaborative interfaces available to patients and providers that, in the past, were technologically barred from these interfaces. Financial savings related to obsolete legacy communications infrastructure will be substantial. Large institutions will easily save tens of millions of dollars in capital and operating expenses. This will all be accomplished while making communications more ubiquitous and more precise resulting in better care and healthier patients. Not Necessary unless customer requests a call to a PSTN number.